The birth of porcelain ware is an important milestone in the history of world ceramics. It requires a technique of firing glazed wares in a kiln that can withstand tempperatures in excess of 1300 centigrade. The beginning of porcelain production in Korea can be traced back to the late 9th or early 10th century. Celadon ware was the most popular ceramic made during the Goryeo period (918–1392), though a small number of black glazed wares and white porcelain wares were also produced. Initially influenced by the styles and techniques of the Chinese celadon producers, the Goryeo potters gradually began making making wares with distinctively native characteristics. Goryeo celadon of the mid-12th century is considered among the finest and the most intrinsically Korean of all Goryeo arts. The period up to the beginning of the 12th century is generally regarded as the early stage in the development of celadon, when plain unadorned celadon flourished. During the reigns of King Injong (r. 1122–1146) and King Uijong (r. 1146–1170), the Goryeo potters perfected the beautiful bluish green hue, known as bisaek (kingfisher color), of the celadon glaze. 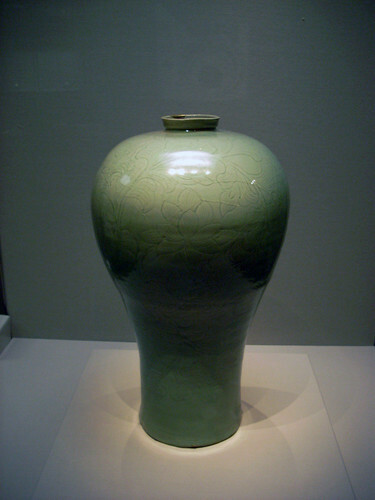 With refinement of the inlay technique, Goryeo celadon reached its zenith in the 12th century. The period from the Mongol invasion in 1231 to the end of the Goryeo period 1392 represents the last stage in Goryeo celadon production. This last stage is historically significant as during this time commoners gained access to celadon wares produced in regional kilns.